Healing music - Be touched by the soothing sounds of flute, clarinet, harp, piano and guitar.relax into a gentle place of flowing harmony and allow the healing to occur... Beautiful reflective music for massage, Reiki, energy work, balancing, Feng Shui and meditation. Stress evaporates into atmospheric oceans, gardens alive with dolphin and whale-song. Crystal-soft melodies float us beyond all discomfort to the place we are healed. Click Buy (above) to buy the album or any track(s) in 320k MP3, FLAC, or just about any other format you could possibly desire. The Music Mosaic label is doing something unique. They're licensing music (tracks) from artists in diverse genres of instrumental music and either placing them onto themed compilations (like this one) or burning "customized" CDs for people who select the tracks one at a time from their catalog (on-line). I have another one of their themed compilations that I'll be reviewing at a later date. 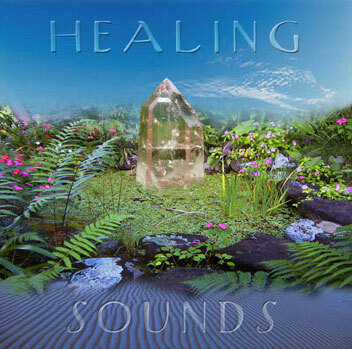 This one, Healing Sounds, is about what you would gather from the title - a collection of soothing, relaxing "classic" new age music from an assortment of artists. What may be surprising, though, is how diverse the music here actually is. While I am familiar with only three of the artists on this album (Daniel Paul, Steven Halpern, and Georgia Kelly) most of the music on Healing Sounds fits the genre classification of new age music perfectly. All of the songs on the album are well performed and excel at creating an atmosphere of relaxation. Aquarius (a solo artist) contributes "Return of the Dolphins" which blends acoustic guitar and lush synths to create a peaceful pillow of fluid melody. Halpern and Kelly team up (on keyboards and harp, respectively) for "Dharma Duet" combining his bell-like tones and her graceful concert harp. "Blue" from synthesizer player Tarshito (accompanied on flute by Anthony Branagan) is also quite lovely (accented by the sound of waves on the shore). As mentioned above, there is diversity here as well. Shastro plays a haunting clarinet, accompanied by evocative piano from Nadama, on the plaintive "Zen Garden." The presence of clarinet actually lends a Klezmer-fusion music feel to the song. Fascinating! That cut is followed by another clarinet number, this time with multiple clarinets multi-tracked. This song is "Hillpipes" and is performed by Linsey Pollak - and yes, again the song has a faint Klezmer sound to it, although the many layers of clarinet actually sound less so than the previous selection. Two cuts on the CD are as much world fusion as they are new age in character. "Oceania" by Daniel Paul (assisted by Jai Uttal, Raphael, and Glenno Falkenberg) has a strong East Indian texture, courtesy of tabla, dotar, and tarang. "Dolphin Babies" by Kallash (accompanied by Rainbow Baba and Thomas Lemke) mixes didgeridoo, tabla and keyboards to produce a mysterious, sensually rhythmic and musky blend of Australia and India. There are some eerie jungle-like sound effects (synthesized bird calls, I think, and human babies at play near the song's end) that will prove either grating or provocative, depending on your mind-set. The cut is not as successful as other songs here, but it's interesting and not the least bit distracting from the overall mood of the album either. Whoever selected these tracks and sequenced them knew what he/she was doing. Sequencing unfolds nicely, both setting and sustaining a peaceful vibe throughout yet doing so with enough changes in instrumentation and melodic texture to maintain listener interest. As an introduction to the "softer" side of new age music, and one that focuses on lesser known artists (these artists may, however, be more well-established in the metaphysical marketplace, but not to those who buy their new age music at Borders or Best Buy), the album is wonderful. Even I (after hearing hundreds of new age music albums) was impressed with the music on Healing Sounds. The overall quality exhibited here bodes well for how seriously the folks at Music Mosaic take their credo (in the liner notes) "You will hear multi-cultural musical expressions from diverse countries, yet the sounds flow together in harmony...like a beautiful mosaic!" I couldn't have said it better myself!